Description: THIS PRINT IS NO LONGER AVAILABLE. Known for his prints of New York City, realist artist Bill Murphy is one of the few graphic artists who seems comfortable depicting the heightened contrasts and mystery of urban nights. 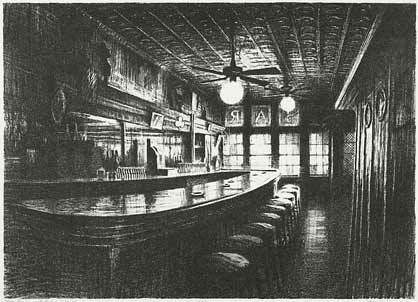 Having once seen this dense and murky lithograph, it's impossible to step into a tin-ceiling bar without recalling it. This original lithograph is from a signed and numbered edition of 100. To learn more about this printmaker and painter who is represented in collections including: British Museum (UK), New York Public Library, Westinghouse Corp., Staten Island Institute of Arts and Sciences and Wagner College. To learn more about this artist, visit Bill Murphy's Staten Island studio. View more artworks by Bill Murphy.